Mobilink has revised its SMS Plus offer by restricting its subscribers to send up to 250 SMS to any network in Pakistan from 7am to 7pm at a rate of Rs. 1.5 + Tax. 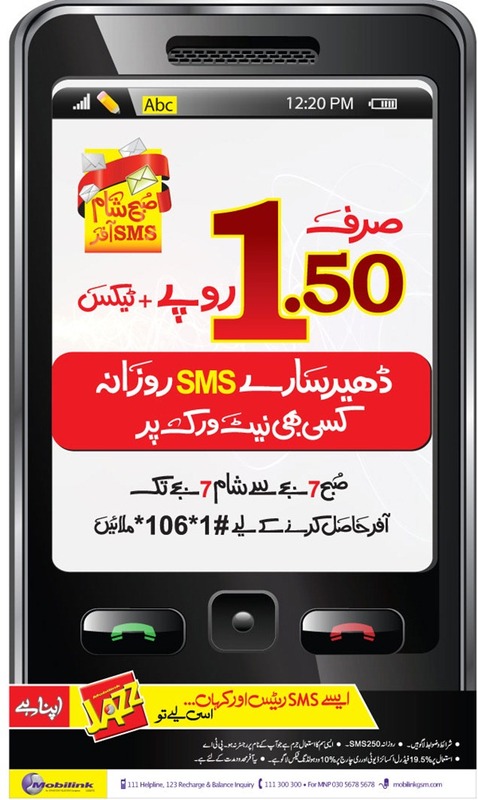 Earlier, with SMS Plus offer, Jazz subscribers could send 500 SMS from 12 AM to 12 PM for Rs. 2 plus tax. Rest of offer details and service mechanics remain unchanged. Subscription Process: Dial *106*1# on mobile screen and press send. Guys Mobilink never give u an offer with full open favour to subscriber. Where Mobilink are, I don’t know how they are offering such useless offers. Anybody knows when will you receive a SMS on your cell? so this offer is useless due to the time bases packages.